November 2015 is a hard month for RMT markets. Most of the games have major drops in their in-game currency prices especially on ArcheAge, Guild Wars 2, and SWTOR. The main reason of the drop comes from their recent patch updates last month. World of Warcraft is the only game in our list that has an increase in its gold price. 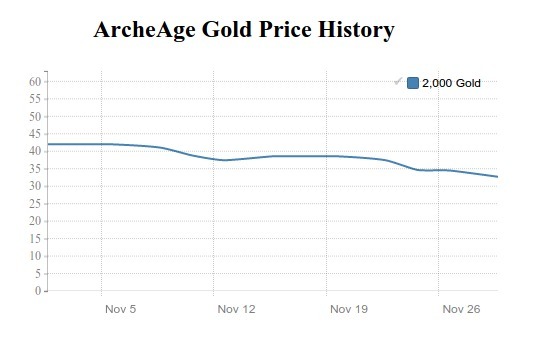 Surprisingly, ArcheAge Gold price has decreased about 30% during November alone. It is even lower than August, which is a month before the release of ArcheAge 2.0 Heroes Awaken in September. The sharp decline suddenly happened on the 2nd week of the month and it kept slightly decreasing until it reached its lowest point at the end of November. 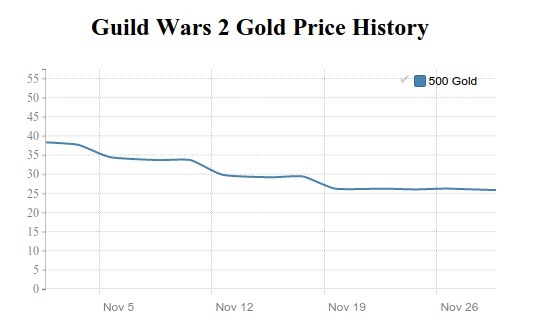 It is believed that ArcheAge Gold price should be even lower in December, but the drop should not be this severe again. The cheapest was on November 30, 2015 which is 2,000 ArcheAge gold for $33.31 and the most expensive was on November 2, 2015 for $50.00. The discrepancy was as high as 50.11% different. EVE Online ISK price was quite smooth in November expect for the last week. The fluctuation during that period was from the Black Friday Deals promotion from various famous RMT suppliers such as goldah.com EVE Online ISK price should return to the original price soon during the first two weeks of December. However, there's also a chance that it will go down again during Christmas Sales. The cheapest was on November 30, 2015 which is 2bn EVE ISK for $30.68 and the most expensive was on November 2, 2015 for $40.40 USD. The discrepancy was at 31.68%. FFXIV news was very quiet during November and this resulted in the stability of its Gil price as well. Final Fantasy XIV Gil price was in the range of ~$18-19 USD per 5m Gil for the whole month. And the highest different rate was as minimal as only 6.06%. The average price should be slightly higher in December since Square Enix is going to run a promotion campaign to recruit new subscribers called “Free Login Campaign: Up to 96 Hours”. But the rise in price should only last for a small period of time. The cheapest was on November 13, 2015 which is 5m FFXIV gil for $18.48 and the most expensive was on November 20, 2015 for $19.60. It was only 6.06% different. The impact of “Knights of the Fallen Empire” only lasted for a temporary period of time as expected. 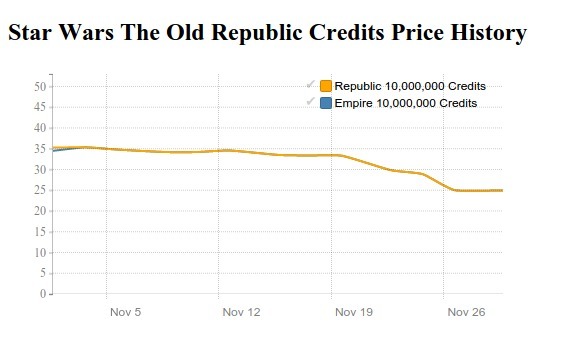 Worse, SWTOR Credits price had a sharp decrease to be as low as ~$24.96 USD per 10m Credits which is the lowest price so far in 2015. However, its decline should not cease since it should be even lower in the beginning of December. And the 4th Anniversary Event should not help much since it only gives in-game items to players. The cheapest was on November 30, 2015 which is 10mn SWTOR US Credits for $24.98 and the most expensive was on November 4, 2015 for $35.53. It was 42.35% different. Enmass still kept releasing a lot of marketing events even after the release of the Lost Isle on October 13, 2015. These events include double exp weekend, double dungeon drops, and so on. These result in the stability of Tera Gold price within November. The price should have a very slight decrease in December and should stay in this range for a few months. The cheapest was on November 13, 2015 which is 20,000 Tera Gold for $25.98 and the most expensive was on November 30, 2015 for $29.49 It was 12.23% different. As predicted by our last month round up, WildStar Gold price returned to the original price of ~$50 USD per 5,000 gold in the middle of November. After that, it stayed in this range for the whole month and even until December. The cheapest was on November 30, 2015 which is 5,000 gold for $49.95 and the most expensive was on November 23, 2015 for $56.06. It was 12.23% different.